Ten pounds of compact pizazz make up this fun loving canine companion. 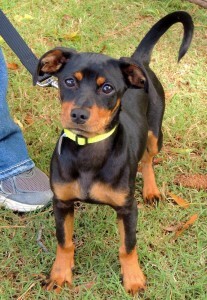 Trixie is a black and brown little lady with a zest for life that can’t be simmered down. 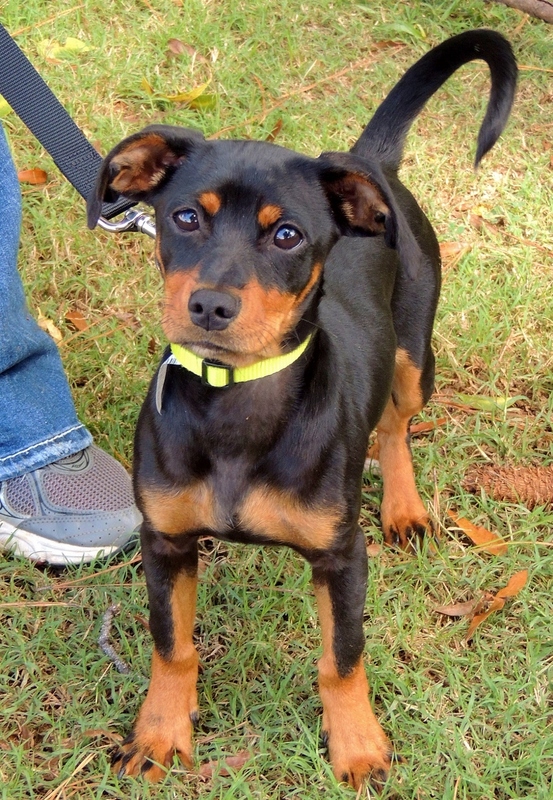 She’s a zippy Miniature Pinscher mix with big goals in mind: to perk up someone’s life and put smiles on plenty of faces. She may not be the biggest pup at the park, but her spicy flair and friendly attitude lets her big heart steal the show. Little kids are just her type, grown-ups are great too, and just about anyone looking to add a pinch of flavor to their lives will find just what they’ve been searching for in this 5 month old pup. Trixie is also a seasoned pro when it comes to making new pet friends and is keen to cuddle on the couch with anyone and anything in need of any extra peppy pick me up. So if you’re ready to kick life up a notch, come by and visit Trixie today. 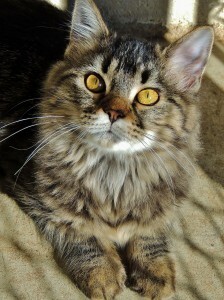 Fuzz Fuzz began her life like a character in a fantasy adventure story book. Today she peeks out from between the pages so you can se that she is the fluffiest former feral feline to have emerged from the “enchanted forest.” This four-month-old tiny Tabby fended for herself in the wild world of a feral colony before being whisked away by her fairy godmothers and transformed into the softest, silkiest princess of all. Her impish antics are on full display when she’s chasing kitten toys, but her house manners are impeccable. Fuzz Fuzz has the ear tufts and long whiskers of wily pixie, but don’t let the glamor fool you for a more loving lady isn’t found in all the land. Now Fuzz Fuzz is hoping to add another transformation to her tale and is currently seeking a cozy home to fill with warmth, love and a touch of magic. Her very own “Happily Ever After” could start with a visit from you.